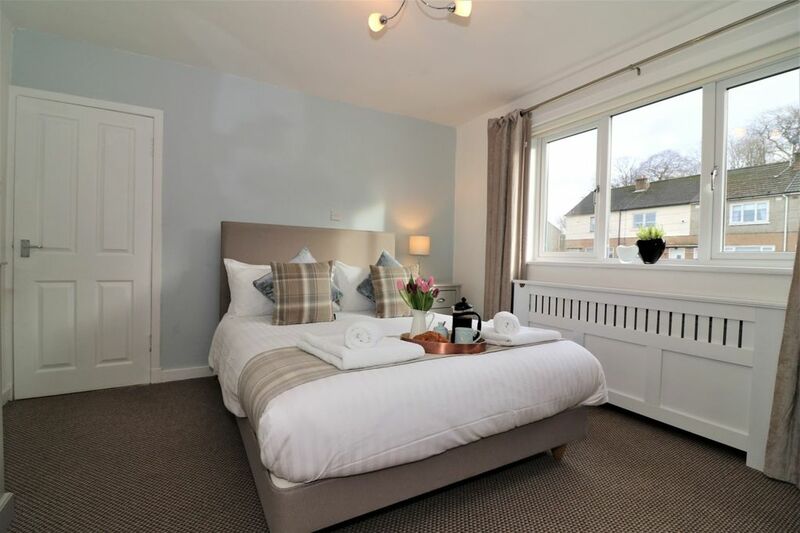 This apartment has been beautifully decorated throughout, with 2 double bedrooms and one twin bedroom (which can be made into kingsized beds on request). All rooms come complete with ample storage space and have been decorated to a high standard. Linen and towels are provided for your stay. There is a well-equipped fully fitted kitchen available for guest use, as well as a reasonable sized bathroom offering all the essentials, including an electric shower. There is also a large cosy living room with a fitted flat screen TV and a wide selection of TV channels and entertainment to choose from. Access to WiFi is complimentary, perfect for planning the next day's adventures! Everything you need to relax after a long day of work or play. Guests will be able to enjoy a home away from home experience during their stay with us and we're always on hand to help where we can. This property is in a very desirable neighbourhood with a Tesco Metro just 12 minutes walk away, as is Knightswood Shopping Centre. There you will find the local pharmacy as well as a number of shops and takeaway establishments. There are many local parks and attractions close by to explore including the beautiful Victoria Park, a great place for picnics and a leisurely walk. It also has offers a number of activities to enjoy, including a model boating pond, orienteering course, tennis courts and even hasThe Fossil Grove Museum which is definitely worth a visit! An escape to the Highlands is only an hour&rsquo;s drive away with the Bonnie Banks of Loch Lomond offering a range of outdoor activities and fun days out for the family and friends. For tourists arriving by air, Glasgow Airport is a 15 minute drive away, and is very easily reached by Taxi or car.